NADAYU Properties Bhd aims to increase property sales by twofold to RM400 million this year, led by its latest launch in Bandar Sunway, Selangor. The developer will be launching Nadayu 28 in August. The project comprises high-rise residences with 10 units of shoplots, worth a combined RM440 million. "We have enjoyed more than 50 per cent sales before the release. We are certain that once the sales gallery is up in July, there will be more coming in," Nadayu chairman Hamidon Abdullah said. Hamidon said yesterday after Nadayu's shareholders meeting that the company is expecting to do better in the current fiscal year ending December 31 2012. Nadayu has RM280 million in unbilled sales, which will be recognised throughout this year, he said. It also has on-going projects worth about RM1.7 billion, being launched in phases. For fiscal 2011, Nadayu posted a pre-tax profit of RM26.7 million on revenues of RM175.8 million. "Today is not just about selling the product and getting purchasers on the table. You have to cross another hurdle which is end financing. This has made the market more difficult," Hamidon said. "The real truth in a company is what you have done before. It is your track record that will give you the edge. Our priority is a satisfied customer, so we get recurring purchasers," he added. 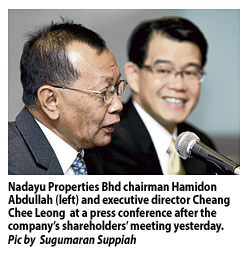 Hamidon said the company is looking to increase its landbank, from its current size of 362ha. The current land size, mainly in the Klang Valley and Penang, is expected to generate a gross development value exceeding RM5 billion over the next 10 years. "We will look at all opportunities to grow the business and expand to new territories," he said.